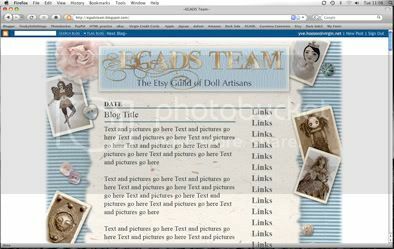 ~EGADS Team~: new blog template??? Hi, this came out a bot more Romantic and Shabby Chic than I originally had in mind, but what does everyone think of it as a new blog template? The photos were randomly picked from a handful of our dollmaker's etsy shops to represents different types of dolls, fairy, paper, sculptural/abstract, goth and animal/human were what I picked. It's lovely, I particularly like the buttons. I really like it. It is a bit girlie, but not overly so. It is the pics of the dolls that stand out which is as it should be. Well done! colors and shapes are very beautiful! I really love it. It is beautiful and elegant. Looks a bit upscale too, which is a plus. Great job!